Recently there have been lots of loliable things on the highstreet, especially things with cupcakes and sweets, but theres also been quite a lot on the gothic side. Topshop has been quite good for accessories this season with nice chunky heart and flower rings, those heart bags and plenty of bows on brooches and headbands. This might be something to do with the fact that some of their current collections are called 'Wonderland', 'Punk Couture' and 'Pagan'. 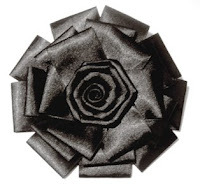 I think one of their best items is this rosette/corsage. Its available on a brooch or on a elasticated headband. It seems that all the shops have headbands with bows of various sizes at the moment but my current favourite is one from Matalan as it has a very thin band. The fabric covering the band has also been sewn on which looks a bit more sturdy than the glued ones. Some of the ones that I got at Claire's a while ago have started to fall apart, mainly at the ends so the plastic starts to dig in the side of your head. eugh. Moving on... I saw this little beauty whilst shopping in Birmingham last week. 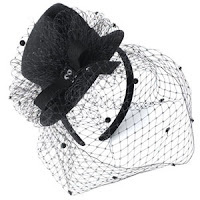 Its a mini top hat mounted on a headband from Accessorize. Its actually more cute in person and I love it, love it, love it. But I do not love that it is £25! Also while I was in Birmingham I went to Blue Banana which is an alternative clothing place conveniently situated right next to a Starbucks. I thought some of their bags were really cool too. They had some of those 'bowler bags' with gothic-y stuff embroidered on the front for £12.